A transport system with curvilinear advancement. For the transport of light and medium-weight workpieces that do not require pallet transport. 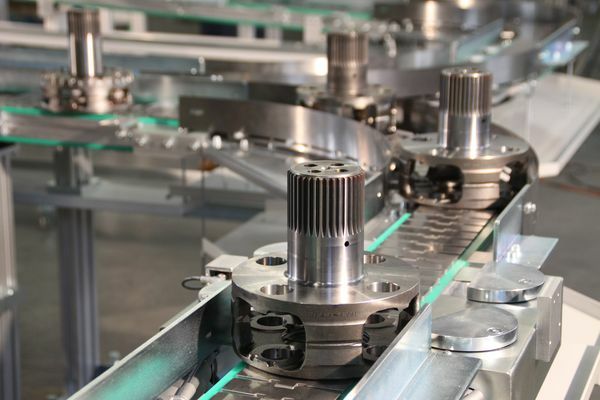 A flat chain conveyor is used as a transport system for machined and unmachined parts. The transport of a part is carried out directly on the chain. With a flat hardened chain, also cast or forged surface semi-products, as well as workpieces with a smooth seating surface, can be transported. Before delivering to the next processing centre, workpieces can be separated and delivered one by one to the next work operation. A flat chain conveyor is manufactured in various versions, lengths, and sizes.